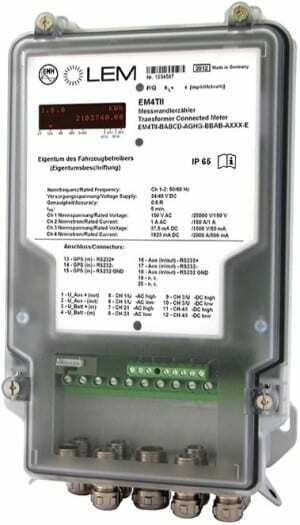 LEM is pleased to become the first company to receive German certification for its EM4T II (Energy Meter for Traction) dc energy meter. As of April 2019, new regulations will require energy providers to only charge end users for the energy delivered to the car (not for the energy lost due to the performance of the charger). Today the only certified meters for billing electricity to the end user are ac energy meters. As dc solution, LEM proposes its proven EM4T II DC meter. Designed originally for railway applications, last month the EM4T II received official certification from Germany’s metrology authority, the Physikalisch-Technische Bundesanstalt (PTB). To meet the market’s future requirements, LEM will also be introducing a much more compact version of the EM4T II soon. This universal LEM Direct Current Meter will be compatible with any charging station up to 600 kW. The energy values are collected and stored in load profiles. The measured data recordings contain details such as date, time, events such as network change, train numbers, frequency, etc. The EM4T II is available in accuracy class 0.5%. In the 21st century, the world faces a huge challenge to reduce CO2 emissions. The impact of CO2 on global warming has been proven, and the progress of new technologies in power electronics and battery chemistry is accelerating. The introduction of an alternative to the combustion engine driven car, the electric vehicle (EV). is a massive advance in technology and the market is undeniably booming. The steadily increasing battery capacity has helped the EV market grow, but the most appealing use cases remain short journeys in an urban setting. To make electric vehicles the vehicle of choice for the wider market and to reduce the carbon footprint of private transport, a network of fast chargers must be installed, allowing users to make long trips without worrying about range or the charging time. Energy suppliers have already started to deploy fast charger networks (30 min, 150kW) and expect ultra-fast chargers (<10 min, 350kW) by 2020. Fast and ultra-fast chargers provide direct current as they are directly connected to the battery. On The Web: LEM S.A.